Suspension: 4 wheel independent suspension with 4 speed sensitive variable ratio rack and pinion steering. 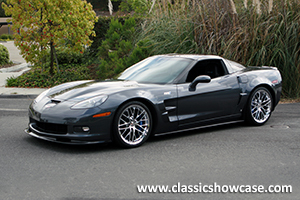 You will truly have an incredible driving experience with everything this beautiful automobile has to offer This ZR1 stands in showroom condition, and has many distinctive features, both performance and convenience oriented. 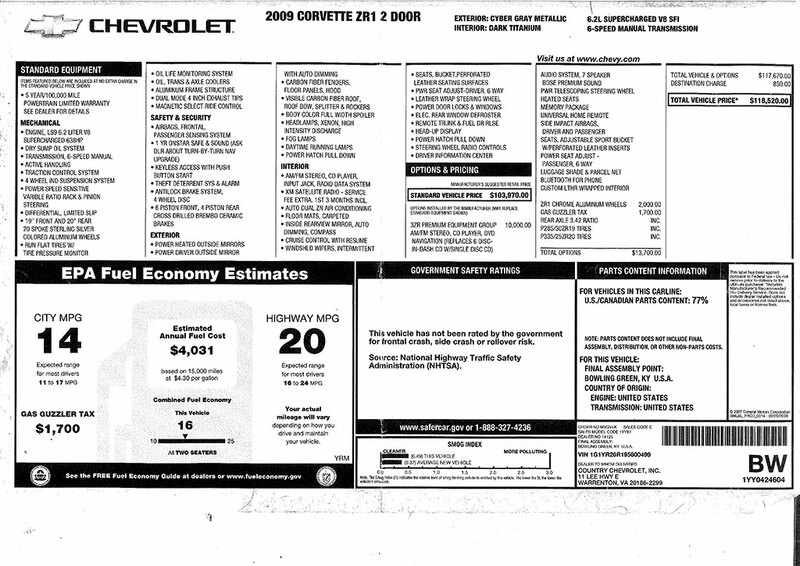 This ZR1 is stated to be fully “loaded with all options;” as such this would include heated seats, in-dash CD, DVD navigation, Bluetooth wireless technology with steering wheel-mounted controls, Bose stereo system with 7 speakers, memory package, universal home remote, luggage shade, steering-wheel mounted radio controls, leather-wrapped steering wheel, Bluetooth, OnStar, dual-zone climate control, and the heads-up display. With all original documents and accessories. Truly an American supercar that brings the technology and engineering refinement of carbon-fiber, ceramics and electronics together in a distinctive design that works to deliver the most powerful and fastest automobile ever produced (when introduced) by General Motors. These are very special cars, starting with the LS9 6.2-liter, supercharged V-8 that produces over 600 horsepower and is delivered through a six-speed transaxle. At the time of introduction, the project manager was claiming that it would have 100-hp per liter helped by the new, four-lobed Roots-type, intercooled supercharger. Low three seconds times are attainable in the 0- to 60-mph sprint. The speedometer has a reading of 220-mph and you can monitor the supercharger with a boost gauge. The suspension has been designed and tested to log over 1g on the skid pad to make this one of the best handling cars in the world. Stopping distances are just as impressive, courtesy of huge carbon-ceramic, ventilated rotors.